Kids are great at knowing how to eat when they’re hungry and stop when they’re full. As adults, we lose touch with this sensation. Many of my clients tell me they can’t remember the last time they actually felt hungry. The hunger-fullness scale is one of my favorite tools to use as you learn to eat more intuitively. I get asked what type of “diet” I eat, or believe in, almost every single day. I hate that word “diet”. Just because I’m a dietitian does not mean I’m a fan of a certain type of diets. What I do believe in: mindful and intuitive eating. That is, being conscious about what you are eating and why and learning to listen in to what your body is feeling. In our busy lives, we tend to multitask. We eat breakfast in the car, lunch in front of our computer, dinner at the coffee table, and nighttime snacks on the couch while watching late night TV. 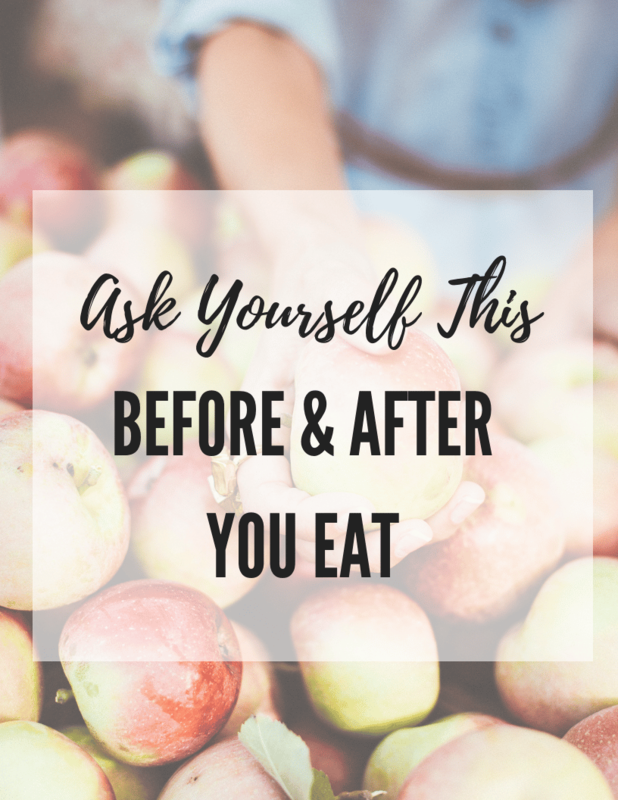 Mindful eating is about getting back in touch with the experience of eating and enjoying our food, while intuitive eating is about learning to tune in to what your body is telling you. No silly diets telling you what you can and can not eat (because that is never fun). With mindful and intuitive eating, you get to decide what you eat and how much you eat. Instead of focusing on external cues (i.e. free food at an office meeting) you focus on internal cues (i.e. what your hunger level is and what your fullness cues say). My favorite tool to use to help you eat more mindfully is the hunger and fullness scale. When you are getting ready to eat a meal or snack, ask yourself, “Where am I on the hunger and fullness scale?” Ideally, you’ll be between a 3 and a 4. Or – do you skip meals and snacks, even when you’re hungry? Or – do you graze on food all day long without ever feeling hungry? If you don’t listen to your body – feeding it when it’s hungry, stopping when it’s not – you can mess up your hormonal hunger and fullness cues. Do this exercise for three to four days, or until you’ve picked up on your hunger and fullness cues. And remember, this can change over time. Some days you may feel full after just a small meal, while other days it can feel like you’re eating a ton and not feeling full. Repeat this practice anytime you’re feeling out of touch with how and why you’re eating. Are you interested in learning more about intuitive eating and how you can learn to tune back into your body’s feelings of hunger and fullness? Check out my nutrition coaching programs and what my clients have to say. Great post :). 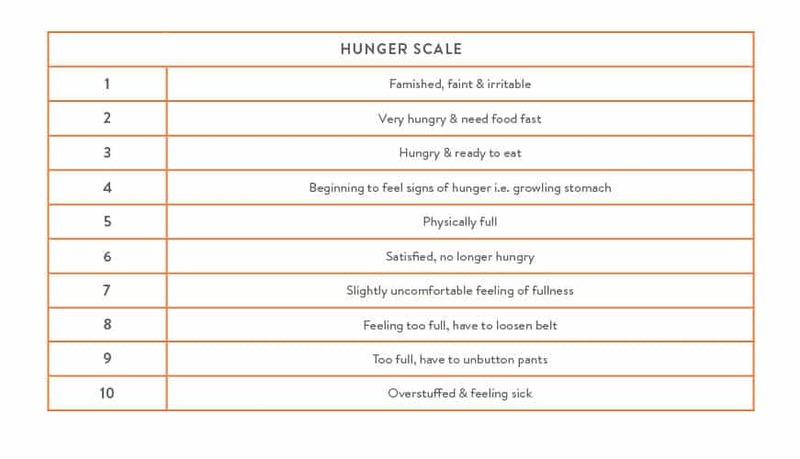 I use the hunger scale analogy a lot in my everyday counseling job, and it seems to resonate pretty well with people. 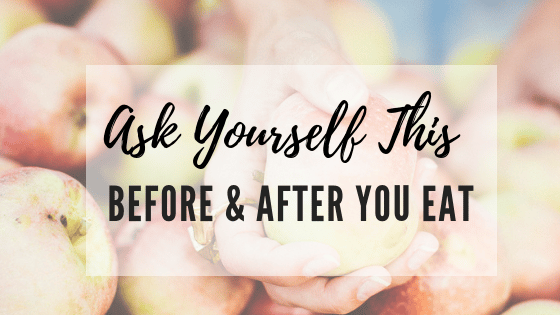 I love the idea of questions to ask yourself if you don’t seem to have normal hunger cues. Thanks! I also love using the hunger and fullness scale with my patients, but I’m curious how you go about helping your clients who “never feel hungry” and they can’t identify any symptoms such as those on the scale. Where do you start in that case? Any helpful exercises to put people back in touch with physical or emotional signs of hunger, aside from asking those helpful questions you mentioned? Thanks! Great question Casey! I like to start with “section” 1-5 of the hunger/fullness scale – i.e. the hunger portion. Starting with a “1” (aka starving/extremely hungry) since this is often the easiest for people to feel/connect to – I ask my clients to describe what this feels like in their body. What body sensations do they feel? Not just emotions/feelings (like irritable or hangry) but how does this actually feel in their body? Then we work to start to reconnect to the body and being to pay attention to the earlier signs of hunger and what it feels like in their body. This takes time and a lot of trial and error. If they are really feeling very little appetite cues, then eating on a schedule is important until those cues start to return. Hope this helps!